Indiana Automotive Fasteners Co., (IAF) occupies a four-year-old facility, specifically designed to accommodate automated production techniques. Of course, dependable material conveying is key to efficient, hands-free automation. Unfortunately, IAF soon discovered that conveyors originally specified for the plant could not stand up to the rigors encountered in the plant’s manufacturing process. 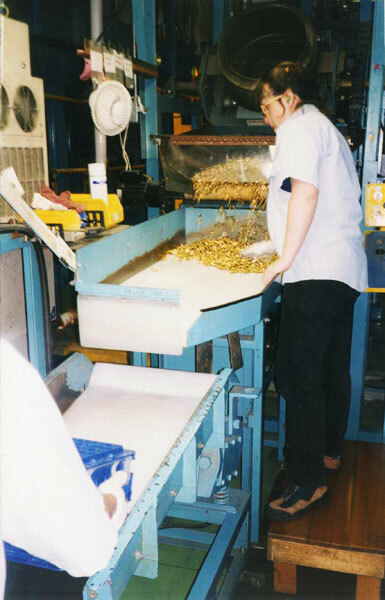 For instance, a plastic vibrating hopper proved to be incompatible with a variety of caustic chemical baths required in the metal finishing process. The wet, chemical environment also proved the unsuitability of a more conventional conveyor with a bearing pulley that replaced the plastic hopper. even after withstanding the repeated impact of 100 lb. containers falling onto the surface from a height of 24 inches. The Dorner 6100 Series Corrosion Resistant conveyor’s innovative v-guided belt tracking system ensured proper belt tracking and eliminated the need for belt adjustments and many other maintenance requirements. Plant personnel also reported that belt changes, when needed, could be accomplished in only five minutes. Because both the volume and variety of fasteners moved through the IAF plant are substantial, trouble-free operation is key to maintaining high levels of plant productivity. Dorner conveyors have proven themselves more than equal to the task of keeping production at the IAF facility moving smoothly.The innovative design and built-in reliability of Dorner conveyors also ensure that IAF’s original goal of maintaining a highly automated production facility is attainable – especially when supported by equipment engineered to the highest standards of reliability and performance.